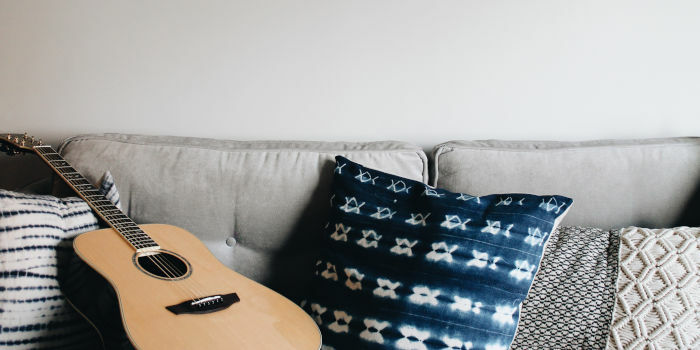 If you’ve been reading my blog for a while, you’ll know that I love practising the guitar with a metronome and having great time. While working on your timing with a metronome is great, a drum machine can help you with your feel. Look, there’s no point being able to play in time but have bad feel. The opposite is also true. 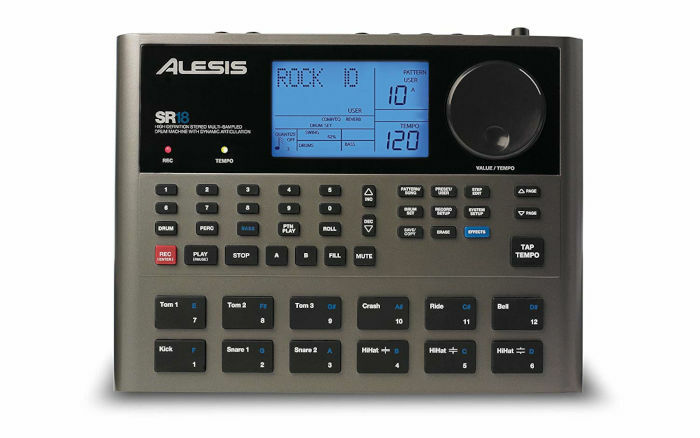 One of the best drums machine available today is the Alesis SR18. You can pick one up from Amazon for around $260. Alesis has been making drum machines since the early 90s. You’ve probably seen the SR16 especially if you’ve spent time in a studio. The SR18 is based on the now classic SR16 but with some new features and updated sounds. While it looks complex, actually it’s very straightforward to set up. Plug in and start jamming to one of 100 preset drum patterns. That’s not all. There’s also a built-in synth bass and effect modules. In short, the SR18 is fantastic for at home practice, songwriting and solo gigs. There are many reasons that Alesis has been around for a long time and the top one has to be build quality. Like Roland/BOSS products, Alesis units are built like tanks and will take years of abuse. Not that you should abuse them! While I would never suggest throwing the SR18 out of a second-floor window or driving your car over it, it’s safe to stay it would survive both and more! So it won’t surprise you that the case is made from powder coated aluminium. The jacks are screwed in, which means they’ll last longer and the rubber buttons feel solid. There’s a load of controls. Thankfully, the top panel has three rows. The top section is mainly taken up by the LCD screen, large rotary control and record and tempo LEDs. These LEDs are super handy, especially the tempo one if you’re trying to improve your timing and feel. There’s a lot going on here, most of which you probably won’t use or need. The key buttons you’ll need are the play/pause, stop and fill. If you’re going to write a bass line or add some percussion then you’ll need to use the buttons marked Drums, Perc and Bass. If you want to use the SR18 to record guitar, bass and drums then the middle row contains all that you’ll need to get the best sound. These include the pattern builder, drum kit selector and effect controls. The most important button on the middle row is the tap tempo button. As a guitarist, you’ll love that it operates exactly as you’d expect. For example, if you normally tap in the speed, then you’ll have no problem getting the tempo right. These 12 pad work differently depending on the mode. In drum mode, you can use them as different elements of a drum kit, such as kick drum, hi-hats, etc. In percussion mode, each controls a different instrument. Selecting bass mode turns these pads into a chromatic scale. So you can easily programme in a bass lines. These pads can also be used to trigger patterns. So that’s the front, the rear has more options than you’ll probably need. There’s an input for a guitar, which makes playing along with the built-in patterns easy. In terms of outputs, there are a few! The headphone out is great for silent jamming or connecting a guitar amp. There are two stereo outputs. One is a TRS jack – AUX out. The other is a pair and is useful if you’re planning to use it to record or run the Alesis SR18 through a PA system. There’s MIDI in and out/thru. Great if you’re a keyboard player! You could use these with a DAW like Protools. You can even use footswitches to start/stop and add in fills using two jack sockets at the end. This might be overkill for home use, but for playing a solo gig, this would be killer! A volume control, power in and on/off switch complete the rear panel. While you can power the SR18 using the included wall adapter, on the bottom is the battery door. If you want/need to the SR18 can run off of 6 AA batteries. As I don’t busk or play without mains power, battery operation is lost on me. So I can’t say if it lasts a long time or not! For home practice, setting up is simple. Grab your guitar, a cable and headphones and you’re good to go. You could, of course, plug it into an amp or Hi-fi. There 100 preset drum patterns to pick from. These cover a range of styles from Rock, Jazz, Latin and more. In addition, there are 100 drum sets to pick from. 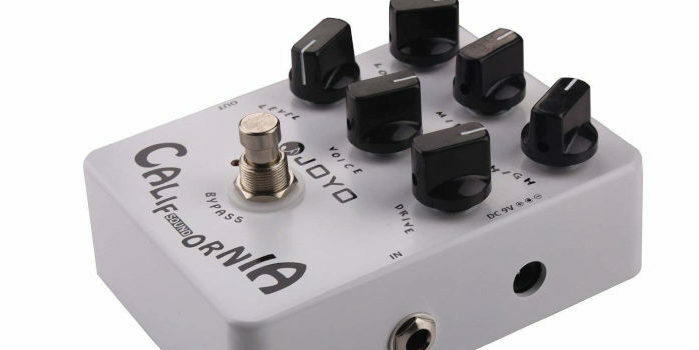 Setting the tempo is straightforward and there are two options (tap tempo button and rotary knob). With the tempo set, it’s easy to start jamming to a preset loop. While you might expect the Alesis SR18 to sound like a toy, the drum and percussion sounds are very close to the real thing. The synth bass overall sounds great as well. I didn’t like the fretless bass sound or some of the more electronic sounds. So once you’ve selected a pattern and set your tempo, then you can start jamming. It’s worth starting with something simple like a Chic song or AC/DC tune. Creating your own patterns is simple. Select an empty bank. Hit record and play at the same time. Then use the lower 12 pads to build your beat. Your pattern will start to loop and so if you want to keep building, you can. If not then hit the stop button. Hitting play will start your pattern, and you can jam with it! 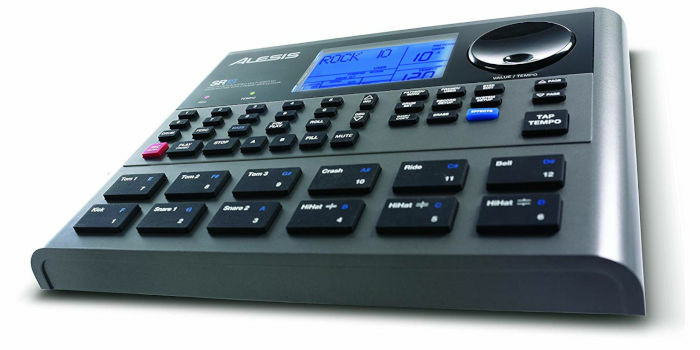 Even with what feels like thousands of buttons, Alesis have made it easy to use and create. Of course, I’ve just scratched the surface. However, you should by now be able to practice for hours! I’ve owned a few different drum machines over the years. The Alesis SR18 is pretty much the best one available. Sure it’s complex and probably has far more options than you’ll ever need. 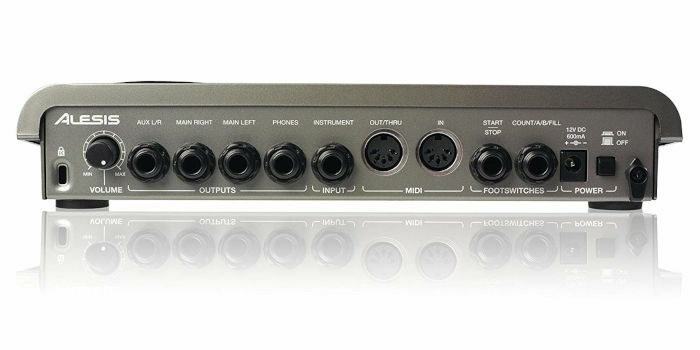 However, Alesis have tried to make it user-friendly. So you’ll be able to jam along with a beat without having to read the manual. Unlike previous models which sounded far too much like a kid’s toy, most of the sounds are killer. Sure they will never sound or feel like a real drummer, but they’ve come a long way. So if you’re looking to improve your feel and time, then it’s worth investing in the Alesis SR18.